Ubisoft’s always entertaining, sometime cringeworthy E3 2018 conference kicks off with a rather unique and colorful musical number which served as an announcement for Just Dance 2019… naturally. JD 2019 is set for an October 2018 release in case you were wondering. The company followed up with really dramatic and damn cool Beyond Good and Evil 2 CG trailer along with some footage of pre-alpha gameplay finally, which looks rough bu promising. They will be demoing the game behind closed doors during the E3. Joseph Gordon-Levitt, who is apparently co-founder of Hit Record, will be helping to get a community-driven initiative for the game’s soundtrack. Next up was a brand new Trials game titled Trials Rising by Ubisoft RedLynx and Ubisoft Kiev. Unlike most previous Trials games, Rising looks to have some fun multiplayer modes to go along with the actual traditional single player with leaderboards Trials experience. The PS4, Xbox One, Nintendo Switch and PC game looks to take riders to locations and landmarks around the world, and there will be a closed beta in advance of the February 2019 release date. Even though we already saw quite a lot of The Division 2 during the Xbox E3 Media Briefing, Ubi had a little more trailer footage to share and also announced a couple of game features including proper co-op multiplayer raids. A trio of DLC and title updates are planned for The Division 2 for the first year, and they will be released for free. The DIvision 2 is scheduled for a March 15th, 2019 release. And then there was a musical interlude to celebrate the addition of Donkey Kong Adventure DLC to Mario + Rabbids: Kingdom Battle. Skull & Bones, Ubisoft’s impressive-looking pirate themed online adventure title, was reintroduced on stage. Sea of Thieves sorta beat them to the punch, but the experience looks very different overall since it’s primarily focused on ship battles. Visually, Skull & Bones is pretty insane looking with crazy detailed ships, water effects and characters. The game is still a 2019 release, with not date announced. Next up was a unique collaboration between SpectreVision and Ubisoft Montreal for a game known as Transference for VR and traditional platforms. They even brought Elijah Wood up on stage to talk about the psychological thiriller which was describe as “a narrative experience that merges movies with games”. It was pretty original looking to say the least. To wrap up the show, one of the surprises for sure was Ubisoft’s new toys-to-life title Starlink: Battle for Atlas which is a family friendly sci-fi adventure title in which players assemble, customize and utilize real-world physical starships which are reflected in-game. 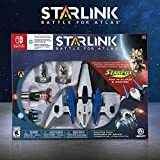 As with games like Skylanders and Disney Infinity, Ubisoft will launch a Starter Pack with the game, a starship, a pilot, a variety of weapons and the Starlink controller mount. As you’d expect, there will be many more physical items to purchase and link to the game. As a super special treat for Nintendo Switch players, there will be an assortment of Star Fox ships, pilots and add-ons and whatnot exclusively for the platform. Shigeru Miyamoto even came up on stage and was presented with a prototype of the Starlink Arwing ship. Very cool! Starlink: Battle for Atlas is scheduled for an October 16th, 2018 release. And that’s about it. We’ll be back with more media and details for most of the announced titles, so stay tuned! Make sure to check out the conference livestream in its entirely below. Check back for additional E3 2018 coverage over the next couple of days.